Did you know that proper placement of shade trees can reduce air conditioner use and lead to significant cash savings? Large, deciduous trees planted on the south and west sides of your home will provide cooling shade in the summer, and won’t obstruct the low winter sun. Tree species with round, horizontal oval and vase-shaped crowns when mature offer the best shading potential. High, wide-crowned deciduous trees provide the best shade. You should always consider the ultimate size of the tree when choosing the type of tree to plant. Trees should be planted 25 to 35 feet from the area to be shaded. Before digging, remember to call Digger’s Hotline. Trees should not be planted near underground pipelines or wires, septic tanks or overhead utility lines. Do not plant a large tree closer than 5 feet from a driveway or sidewalk; it could eventually push up the concrete. 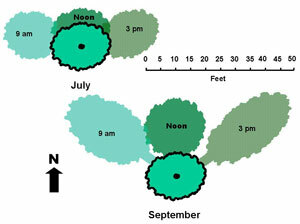 The figure to the right illustrates the shade patterns of a 25-foot tree. Observation is the best way to determine where to plant to maximize shade. You should plant a tree to shade roofs, windows, porches, air conditioning units or other areas of heat gain. Remember, just shading an air conditioning unit can increase its efficiency by 10 percent. Trees cool better than man-made structures because not only are the rays of the sun blocked, but water is added to the air through transpiration.